In Stockport we have a termly ‘Voice of the Child/Young Person’ Champions Network meeting during which professionals working in health, education and social care settings across the area meet to discuss real-life examples and to share information and strategies – during the last meeting in October 2018, we discussed using Talking Mats to support police interviewing. 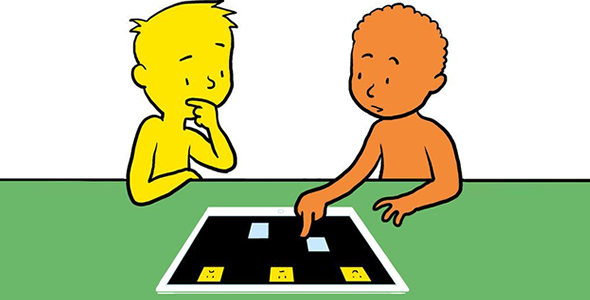 Louise Tickle, Specialist Learning Disability Nurse from the Children’s Learning Disability Team at Stockport NHS Foundation Trust, shared a great example of using Talking Mats to support a child she was working with to share information about a serious safeguarding concern. Louise had been asked by the police to carry out a Talking Mats session with the child as they were aware that she was already using this approach. Louise led the session and was supported by the child’s school SENCO, who had also been Talking Mats trained. The aim was to explore a disclosure which the child had previously made. Watch out for non-verbal cues – initially, the child appeared to be happy and relaxed during the interview, however the child’s non-verbal communication visibly changed when the topic changed. It is easier to pick up on these non-verbal cues if you are able to video the session. Have another Talking Mats trained observer present if possible to support and evaluate the session with you. Make sure you use terminology that the child is familiar with, and use language that the child would use themselves e.g. when describing body parts. Talking Mats are often used by people working within the justice system, including registered intermediaries – here is the link to one of our previous blog posts for more information: https://www.talkingmats.com/talking-mats-used-court/. In this work you must be clear about the different stages of safeguarding and follow the procedures within your organisation. Disclosure and investigation are two different phases. The Keeping Safe resource has been trialled and tested to support people to raise concerns. https://www.talkingmats.com/keeping-safe-a-new-talking-mats-resource-available-to-purchase/ . When a disclosure moves to the investigation phase you may have to personalize the mat to fit the situation but what is key is that you keep the options open and non-leading. This entry was posted in Blog, Child protection, Children and young people, Communication difficulties, Criminal justice, person centred approach, Personalisation, police, Safeguarding, Training and tagged Children, Communication difficulties, Learning Disability, person centred, Personalisation, police, safeguarding, Talking Mats on December 20, 2018 by Lois Cameron.